How popular is the baby name Abraham in the United States right now? How popular was it historically? Find out using the graph below! Plus, check out all the blog posts that mention the name Abraham. One type of acronym that seems to be trendy these days is the “AB_” acronym, in which the first two words are “always be” and the third is a verb in “-ing” form. They stem from ABC, “always be closing,” made famous by the movie Glengarry Glen Ross (1992). Variations I’ve heard include ABS (“always be shipping” or “always be “selling”), ABL (“always be learning”), a different ABC (“always be charging”), and even ABK (“always be knolling“). So I wondered: Could we create an “always be” acronym that’s also a good baby name? Abe is typically a nickname for of Abraham, but Abe is also used as an independent name. In fact, dozens of U.S. babies have been named Abe (not Abraham) every year for many decades. And here are some of the other verbs that could be used: earning, educating, empowering, encouraging, engaging, engineering, enhancing, enjoying, evaluating, examining, exceeding, and experiencing. Abi, like the more familiar Abby, is a short form of Abigail. Abi isn’t common as an independent name, but usage has picked up a bit recently. And here are some of the other verbs that could be used: illuminating, implementing, impressing, improvising, increasing, influencing, informing, inspecting, integrating, interacting, interpreting, and investigating. What are your favorite “always be” acronyms for Abe and Abi? Do you think anyone out there has used an “always be” acronym as a baby name yet? 100 Years Ago, Were Black Names Beneficial? In generations past, was it advantageous for a black man to have a distinctively black name? Yes, according to a study published recently in the journal Explorations in Economic History. So what’s behind this beneficial effect? It’s hard to say, but Lisa D. Cook believes that the black men with Biblical names specifically could have been “held to a higher standard in academic and other activities […] and had stronger family, church or community ties,” and that this could have played a part in their relative longevity. Studies of modern black names, in contrast, regularly find that such names are a hindrance in the workplace, in academia, etc. My most recent post about this is: Men with “Black” Names Seen as Aggressive, Low Status. 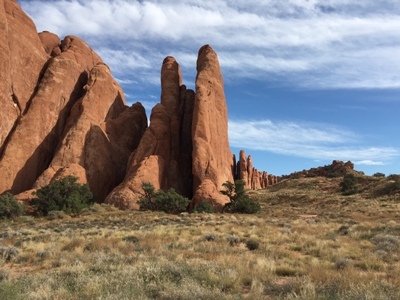 Fins in Arches National Park, October 2014. It was a good guess — we’ve certainly spotted Native American place names (Kaibito, Kanab, Paragonah, Parowan, etc.) on road trips through the Southwest before — but Moab is actually biblical. I couldn’t recall at the time if it referred to a person or a place, but I told him that the ab probably meant “father” as it does in Hebrew names like Abigail and Abraham. The Utah settlement was dubbed “Moab” sometime during the 1800s, but many early residents were not fans of the name and at least two attempts were made to change it: the first in 1885 (to Uvadalia), the second in 1890 (to Vina). Both attempts failed. So has Moab ever been used as a personal name in modern times? Sure has. Though it’s never appeared on any of the SSA’s baby name lists, I’ve found hundreds of people in the U.S. with the name, several born as recently as the 1990s. According to the records I’ve seen, the name was used most often as a boy name, and it was most popular during the 1800s. Unlike Sedona, though, Moab doesn’t have a strong in-state following; most Moabs were born in the Southeast/Bible Belt area. What do you think of the name Moab? Usable generally, usable for religious folks only, too bizarre to be usable at all…?